"It won't be as hard as they say it is" I said to myself. 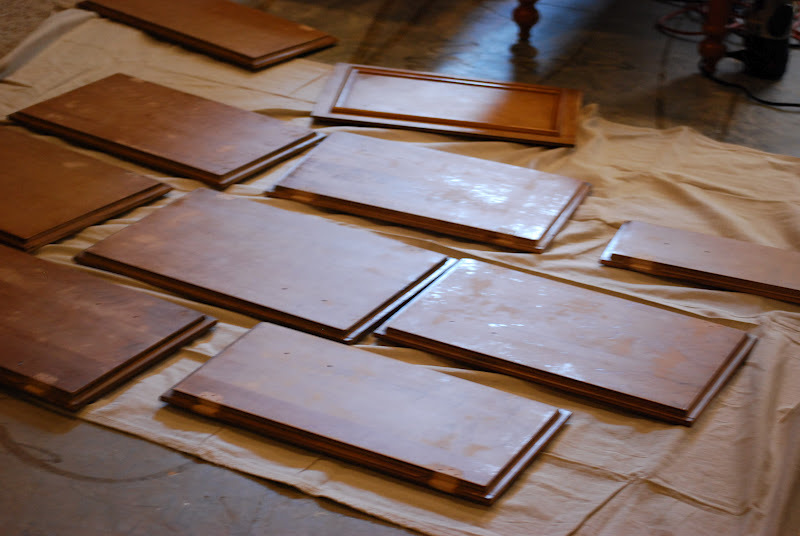 I'd read the other tutorials about cabinet painting and I knew deep inside that this would be one of the most tedious and labor intensive projects I've done. But it's like having children, no one can really tell you how hard it is until you do it. 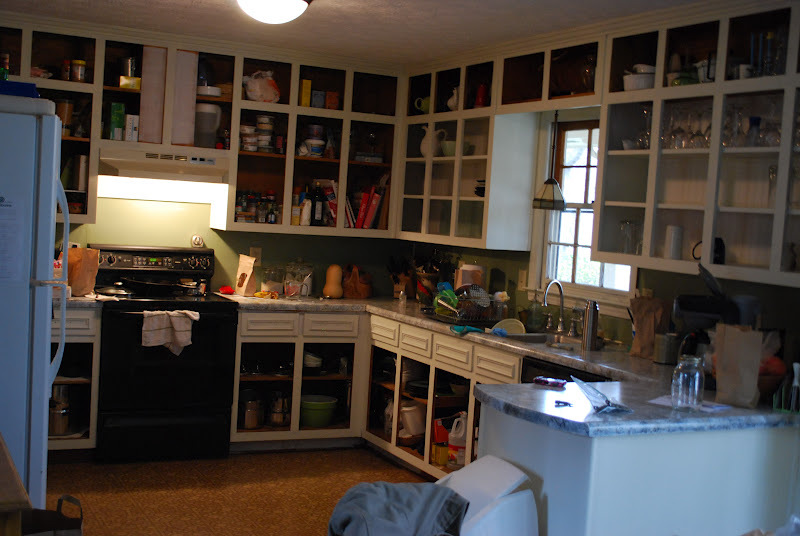 Thankfully my sister came to help over the weekend, and completed an area I had been dreading. The taping and painting of the large bay window. Hopefully today I can get some sanding done on the lower cabinets. I'm not a neat freak by any means, but living in this chaos is starting to get to me. Amidst all the other things I have going on in my life right now, I've decided it would be a good idea to paint the kitchen cabinets. Little Red Barn Sale in Norcross, Ga April 28-29th. I'm so excited to work hard the next couple of months and bring together some great pieces of furniture. I also have some new ideas swimming around in my head that I want to create and sell to the public. If you live in Georgia please mark your calendars and come out to see us in April. I would love to meet some of you! There will be many talented artists contributing to the sale, I'm sure there will be something for everyone. located in Historic downtown Norcross. It's a quaint little town with lots of great restaurants, shopping, and beautiful homes. Be sure to "Like" The Little Red Barn Facebook page to keep up with items that will be for sale. Please leave a comment if you have questions or are interested in visiting. 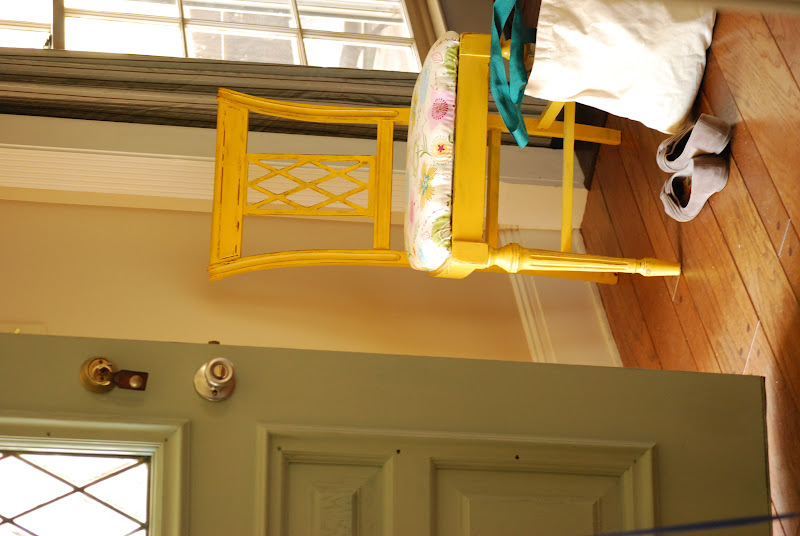 I'm sure by now you've all heard there is another way to achieve the coveted "chalk paint" look, with out the heavy price tag that comes with the name Annie Sloan. 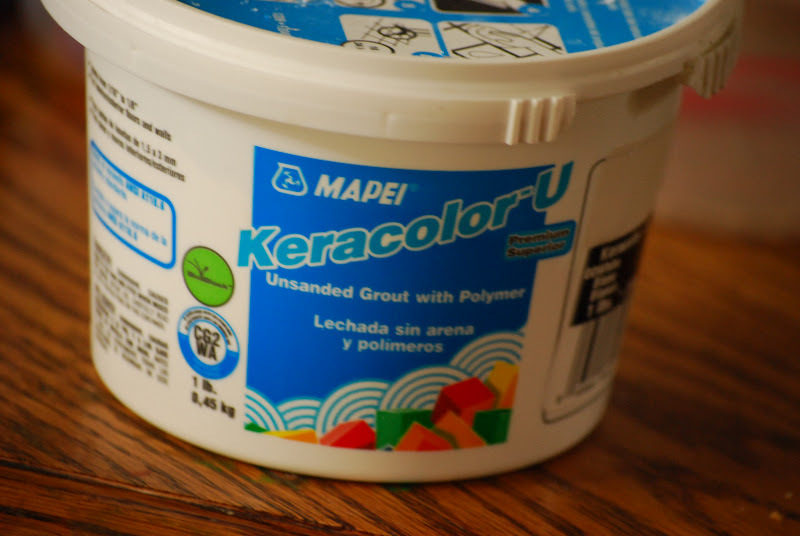 Sorry AS, I have yet to try out your precious paint because I could not justify spending the $40 for a small quart of paint! I found it at Lowe's and mixed it up with my paint. 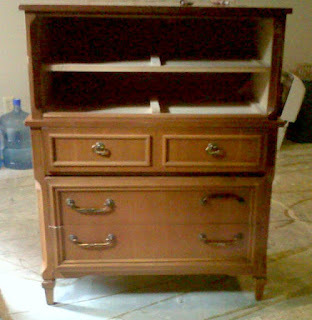 This dresser was my guinea pig. I didn't sand or prepare the surface at all, just started painting. 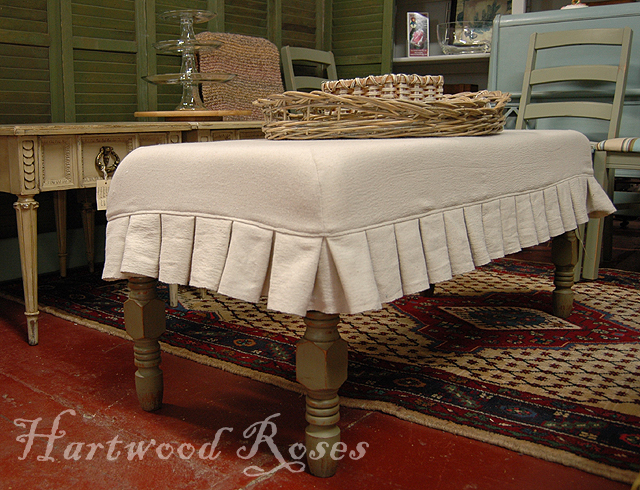 Like I said I had never used the Annie Sloan stuff, so I can't compare. But it worked pretty good and I will use it again. I did need to use 2 coats, and I chose to sand it a little after it dried, because it felt a bit gritty. Then I painted another light coat of just the regular paint on top. I love the look and feel I got from this experiment, I think I will try Plaster of Paris next. 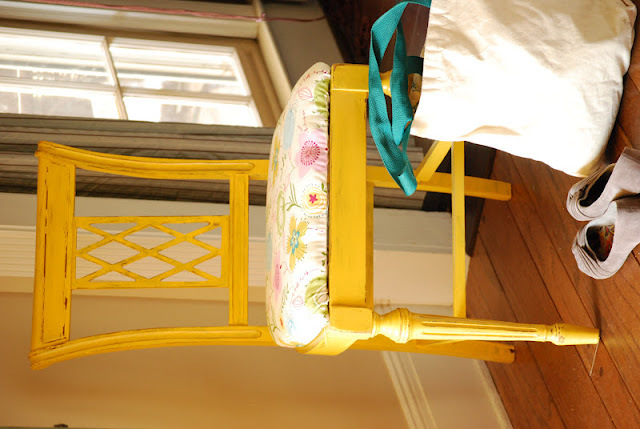 Cassie tried it with her chairs and they turned out fabulous! Let me know if you have any tips about DIY chalk paint. 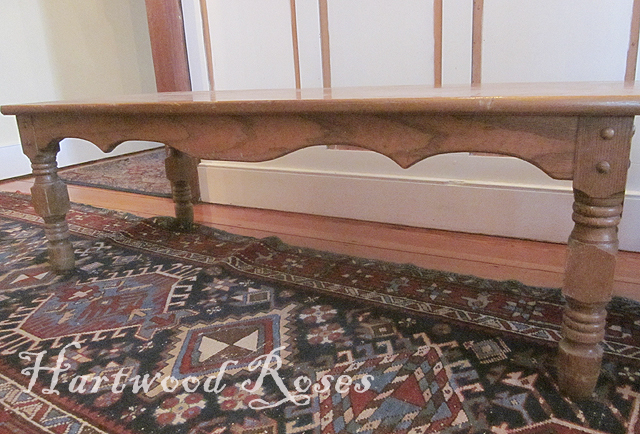 During my stroll through blog land I came across Hartwood Roses and her amazing coffee table turned bench. I'd been searching for something to make that I could put in the "mudroom" area of our kitchen. Connie had this beat up old table, and just knew she could turn it into something special. Isn't that the cutest? I've seen coffee tables converted to ottomans, but not many turned into benches. I may not do the pleats, too much trouble for me. But I will definitely work this into my vision. Thanks Connie for the inspiration! 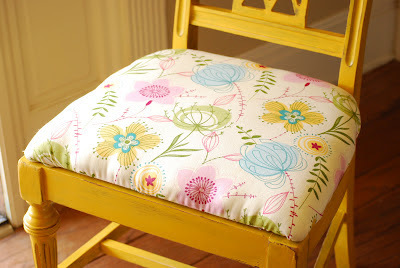 Check out her blog to see her step by step process on how she made the bench. My favorite thrift store usually has free items out front that are first come first serve. The usual suspects are old, dingy couches with nits in them and broken chairs. But occasionally I can find something neat. A couple weeks ago I took home this cute little chair, since it was free I decided to try something different. I wanted to stray from my "safe" colors and go with a bold new look. First I picked out some fabric to recover the chair, then I picked a color within the fabric that I already had in my collection of paints. Yellow. I also added a bit more cushion on the seat. I adore the sweet lattice work. I want to challenge you to create beauty in an unwanted item, and send me the proof. I'm not really all that into Valentine's Day. However, I felt like being a little creative yesterday and figured I'd jump on the bandwagon with all the other bloggers and give you a recipe for a special treat on February 14th. My 2 year old, I assume like most, is obsessed with cake. Almost every day she will make one of the following statements. "I have an idea mommy, how about some chocolate cake?!" or "Mom, I'm hungry I want some cupcake." and the ever popular " I know! We can have chocolate cake!" Soooo..... cupcakes were made. For the first time in several years I dusted off my cupcake tin and and got to work. My sister Jamie posted a Hershey's recipe on her blog a while ago and that's what I used. I also made my own frosting. OMG ( I don't say that, unless I mean it) they. were. heaven. 1 Heat oven to 350°F. Line pan with cupcake papers. 2 Stir together sugar, flour, cocoa, baking powder, baking soda and salt in large bowl. Add eggs, milk, oil and vanilla; beat on medium speed of mixer 2 minutes. Stir in boiling water (batter will be thin). Pour batter into prepared cupcake pan. 3 Bake 30 to 35 minutes or until wooden pick inserted in center comes out clean. 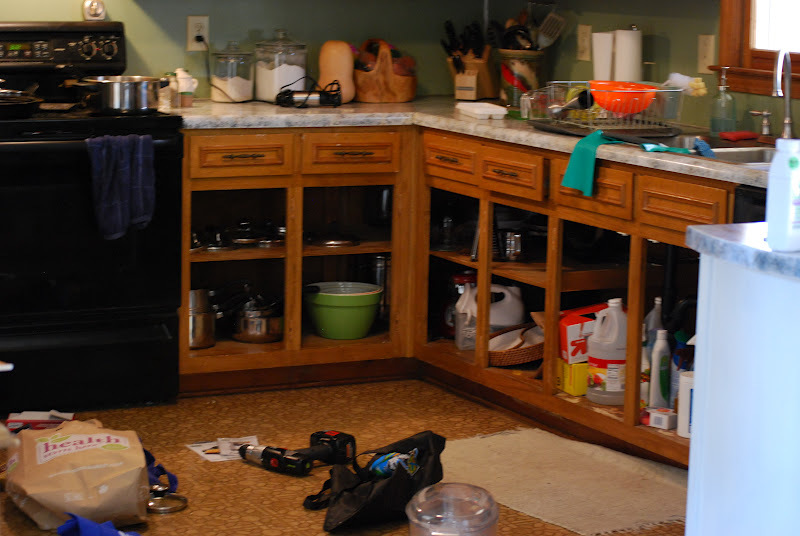 Cool 10 minutes; remove from pans to wire racks. Cool completely. 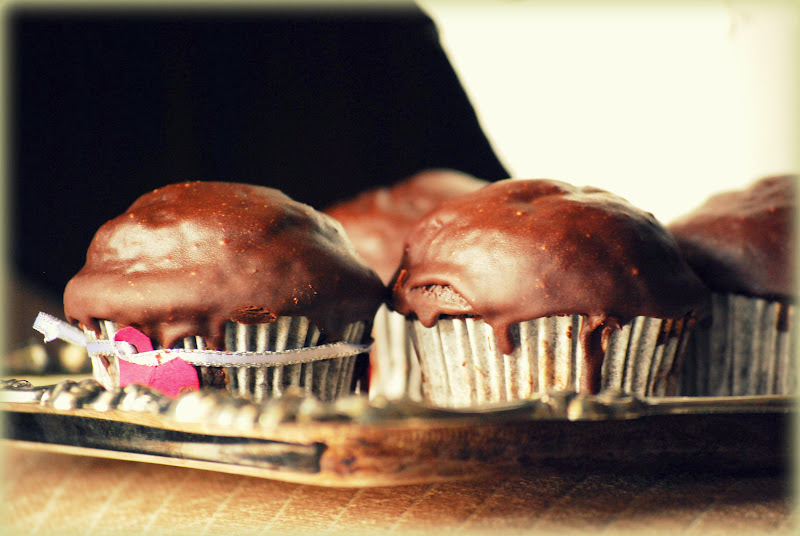 Click here for the amazing frosting recipe I used . It was probably one of the best cupcakes I've ever had. 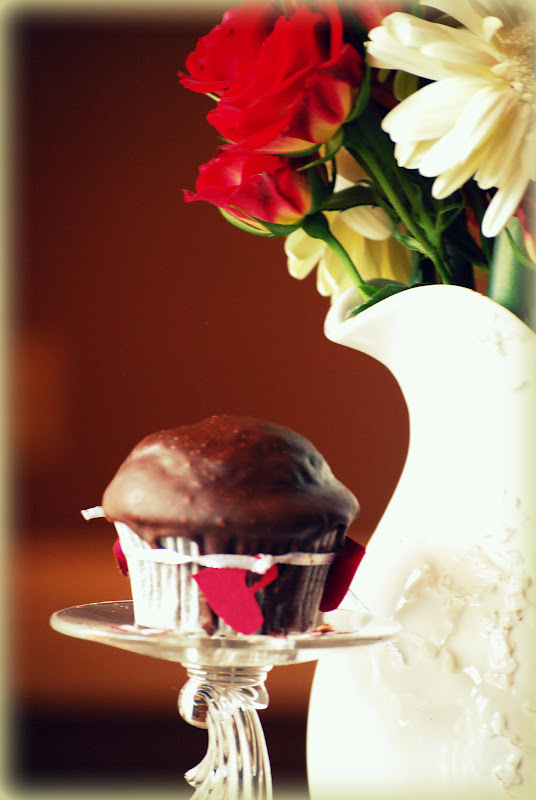 Do you see how the frosting is dripping slowly down the cupcakes edges in that first picture? Yeah you do! I absolutely love how she used the same hardware, just spruced up a little with some Rub n' Buff. Head on over and pay her a visit to see more pics. Reason #254 why I love living in the South. On any given day in the winter, the temp outside can be 70 degrees. I had my windows open and it was lovely. I'm sure most of you already know my next guest. 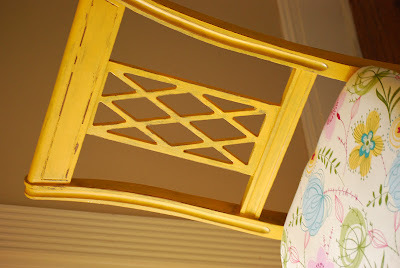 Cassie has been around the blogosphere for a while and was one of the first furniture blogs I started reading. 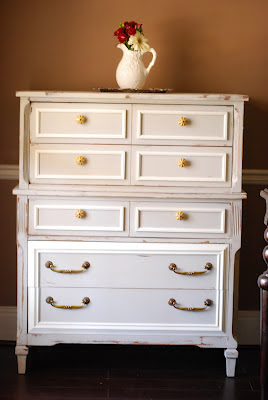 She greatly inspired me to start my own blog and furniture refinishing. This girl is so sweet and a genuine blog friend. Always taking the time to comment and reply with sweet messages. So here she is Cassie from Primitive and Proper! Hello Between Blue and Yellow Friends! 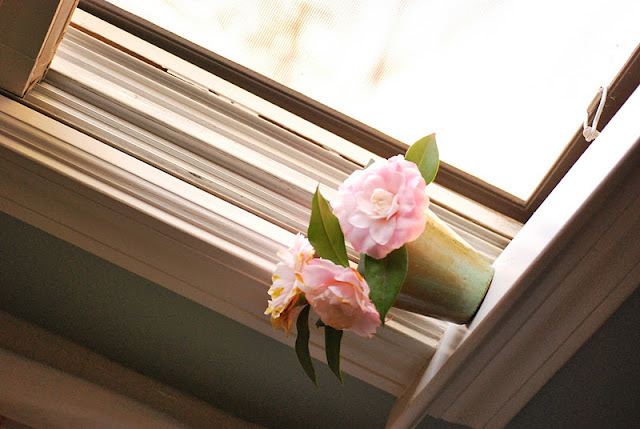 I am Cassie from Primitive and Proper, where I blog about furniture makeovers (and have a weekly furniture link party), home decor and design, and all sorts of creative miscellany! I am so excited to be here today on Kathleen's blog! In blogging terms, Kathleen and I go waaaaaay back and I am so looking forward to meeting her in person when we go to Haven! And I get to spend an extra day after that with Kathleen, as she shows me the awesome shops in her neck of the woods. I can't wait- we are going to have a blast! Anyhow, a love of redoing furniture is what originally brought Kathleen and I together, so I thought I would share a furniture makeover with you today. 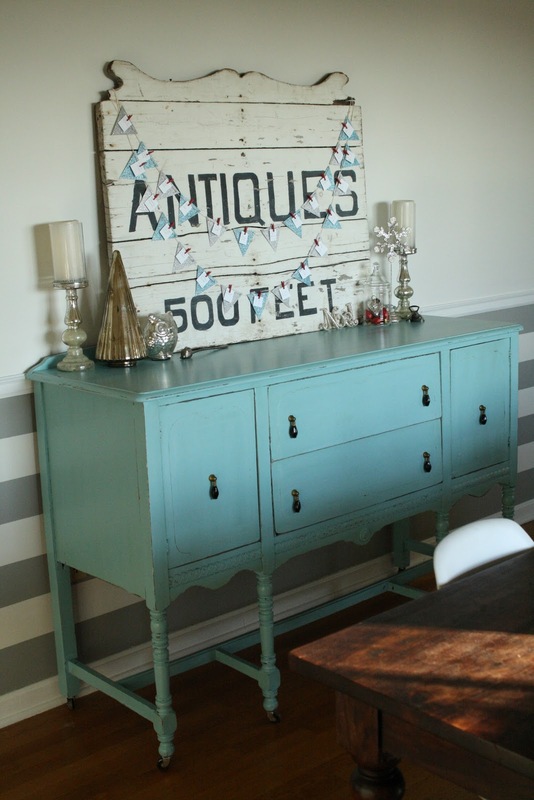 And how bout a little mix-it-yourself chalk paint, too? Now, if you follow me on my blog, you rarely see me do chair makeovers, and there is a reason. I really do not like sanding all those small detailed areas that really have to be sanded by hand. Chalk paint is a great solution, but at $38/qt, it's not exactly easy on the wallet. So what's a girl to do? 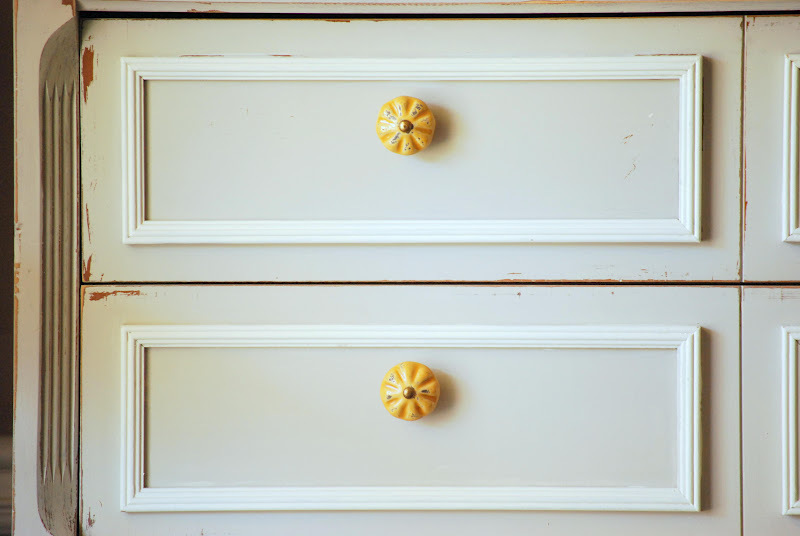 Make my own chalk paint of course! Because there was no way in heck I was sanding all those little spindles! I have had a few blog friends already try this process out, so I checked out their posts about it. I think Sherry was the first person to write about it, and then Sharon and Carmel both tried it, too. Well, if a few of my blog friends could do it, I knew I could, too! All I needed to buy for this was Plaster of Paris available at Home Depot. I bought a small carton (And to tell the truth, I actually had my husband pick it up so I don't know the exact price, but it is dirt cheap.). As you can see the aqua is very pretty, but more vibrant than I wanted on the chairs. I wanted the chairs to be more "faded" and worn looking. I had heard that this method of mixing chalk paint created a lighter variation of the original color, so I went on mixing to see what would happen. And the color came out perfectly! It was exactly what I wanted!!! I didn't prep the chairs except to lightly sand the backs and seats with my orbital sander. Then I applied two coats of paint, which was plenty to provide the right coverage. Now, as a note, I was very nervous after the first coat that it wasn't sticking properly. However, once I added the second coat and the paint was thicker, I did not have those problems. After the two coats dried, I used 150 grit sandpaper to distress the chairs by hand. 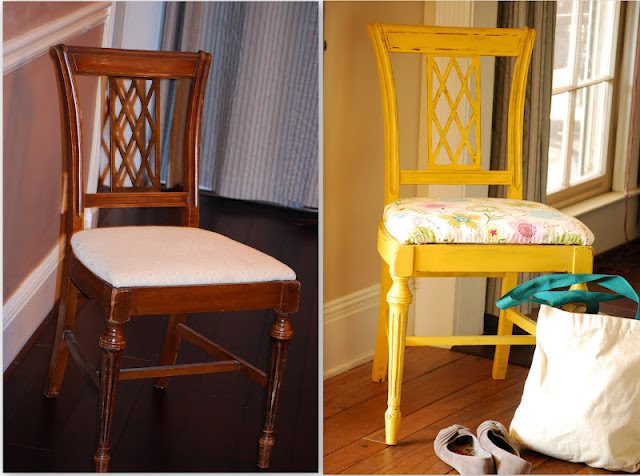 Here is an image that shows the chair on the left undistressed, and the chair on the right already distressed. 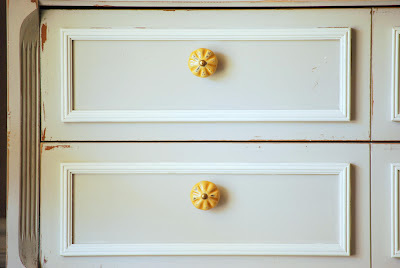 I found the distressing with the homemade chalk paint MUCH easier than distressing with store bought. Also, with store bought, I go through several pieces of sand paper as the paint "gunks up" on my sandpaper. 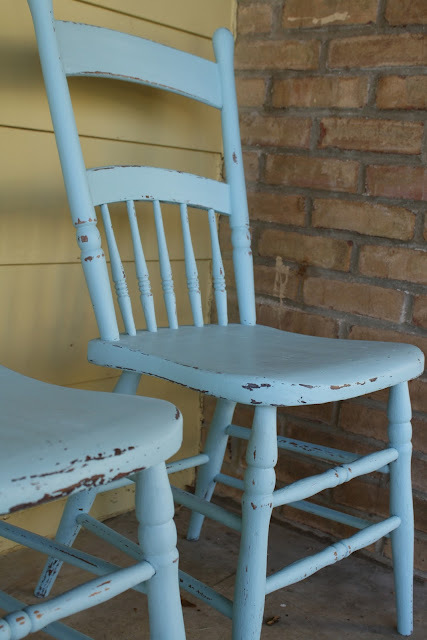 I used one piece on all 4 of these chairs, and here is what it looked like when I was done.... still perfectly usable for the next distressing project! I also liked the "chippy" look this paint had when distressed. They looked well loved! The final step I took was applying a finishing wax. There are several brands out there, and I have a couple of favorites. The one I used for this project was Briwax in natural. I simply dipped a rag into the tub, and picked up a little at a time, wiping all surfaces of the chairs. 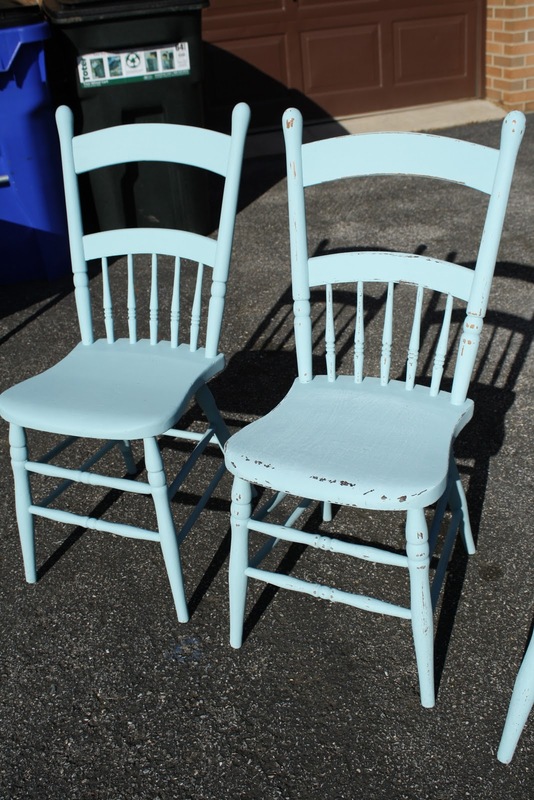 When I had finished, the chairs had just the look I was going for, and the wax gave them a nice hard finish. Here they are, ready to be pulled up to a rustic farm table, or perhaps a modern white tulip table. Chairs like these mix well with many styles! Thank you so much, Kathleen, for having me here today! I hope you will pop over and visit me at my blog! I wasn't quite sure about this recipe when I first saw it at Annie's Eats, but I've been a little more adventurous with my cooking lately so I decided to give it a go. My man is a very "meat and potatoes" kind of guy, so I was pleasantly surprised when he said he liked this meal. Of course, it would probably be best with fresh corn, garden tomatoes and soft avocado. But I did my best with it being winter and all. To make the salsa, combine all of the ingredients except the avocado in a medium bowl and mix well to combine. Cover and refrigerate until ready to serve, up to 2 days. 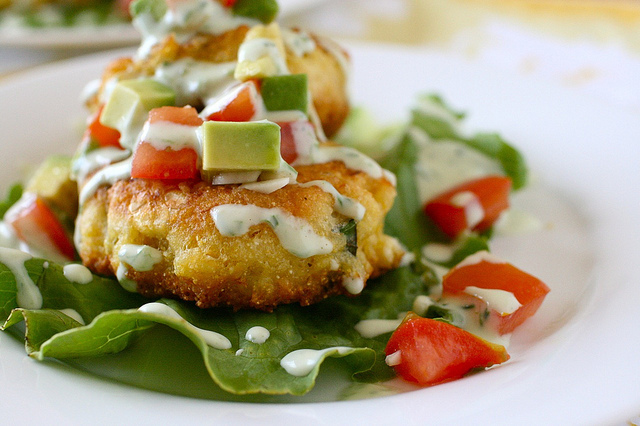 Just before serving, mix in the avocado. Place a large skillet over medium heat. Add just enough oil to barely cover the bottom of the pan and heat until sizzling hot. Scoop the batter into the skillet a heaping tablespoon at a time, cooking the cakes in batches of 4 or 5 so that they are not touching. Fry 1-2 minutes per side, until golden brown. Transfer the cooked cakes to a wire rack and repeat with the remaining batter.